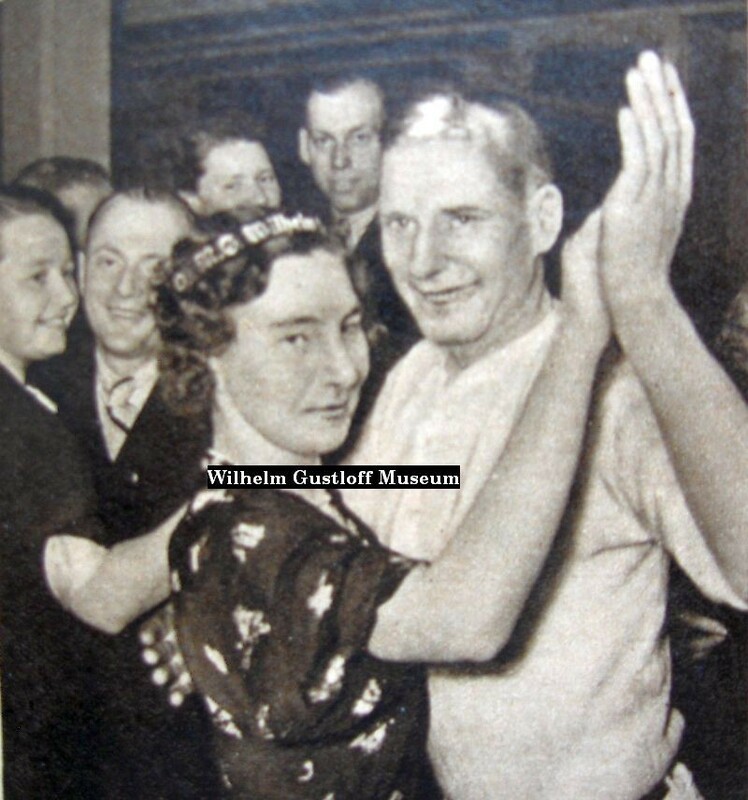 The first major cruise of the Wilhelm Gustloff and its proactive Austrian agenda was not the typical Strength through Joy voyage. The fourth voyage of the Wilhelm Gustloff would also prove to be uncharacteristic - except in this case the propaganda was unplanned. This time, the Gustloff will head toward the Strait of Dover instead of the North Sea. Leaving Hamburg on April 1st, the Gustloff will be sailing to the English Channel to meet the KdF fleet returning from Madeira on April 4th - the Der Deutsche, Oceana, and Sierra Cordoba. One day into the cruise heading westward toward the English Channel, the Gustloff encounters ​uncooperative weather - much worse than encountered during its test run over two weeks earlier. More ominously, its radio room receives an SOS from the 1,825 ton English coal ship Pegaway on April 3rd. A victim of the storm, it is damaged, rudderless, and sinking 25 miles northwest of Terschelling Island, Netherlands. ​ Captain Lübbe orders an immediate course set for the Pegaway and breaks away from his three-ship entourage. The Dutch salvage tug Holland also heads to the scene. The crew spots the failing ship with searchlights within a couple of hours. 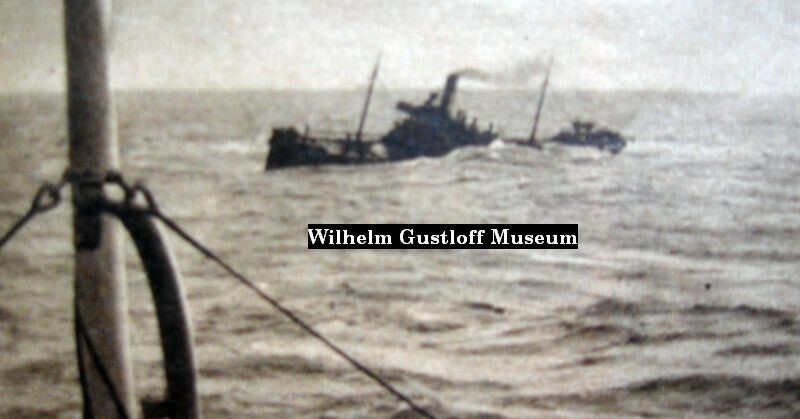 However, the weather worsens and it is 7:45am the next morning before 19 seamen of the condemned English ship are rescued using one of the Gustloff's motorboats. The same motorboat is also used to rescue one of the Gustloff's own lifeboats and crew. The manual rowing lifeboat No.1 had been used in an earlier attempt to rescue the English sailors, but it is thrashed against the side of the ship and careens off with heavy damage. It eventually washes up on the shores of Terschelling Island on May 2nd. The rescued sailors are on board as the Gustloff rejoins its detached fleet and returns to Hamburg at noon on April 5th to a thunderous welcome. ​The heroic rescue plays well in the media. Local and international newspapers laud the efforts of the captain and crew of the newest addition to the KdF fleet. Set of 13 original photos of the Pegaway rescue taken by a passenger on board the Wilhelm Gustloff. April 4th, 1938 & includes an original newspaper article focusing on the rescue with translation. #1: The Gustloff approaching the Pegaway. #2: "English coal ship "Pegaway" in distress, M.S. Gustloff is assisting to rescue." #3,4: The Pegaway riding the waves. #5: Preparing to launch the Gustloff lifeboat. #6: Launching the rescue lifeboat. #7: Back of card: Unknown. #8: Lifeboat 1 returning with passengers & crew. #9: Mentions a rowboat and dated April 4th, 1938. 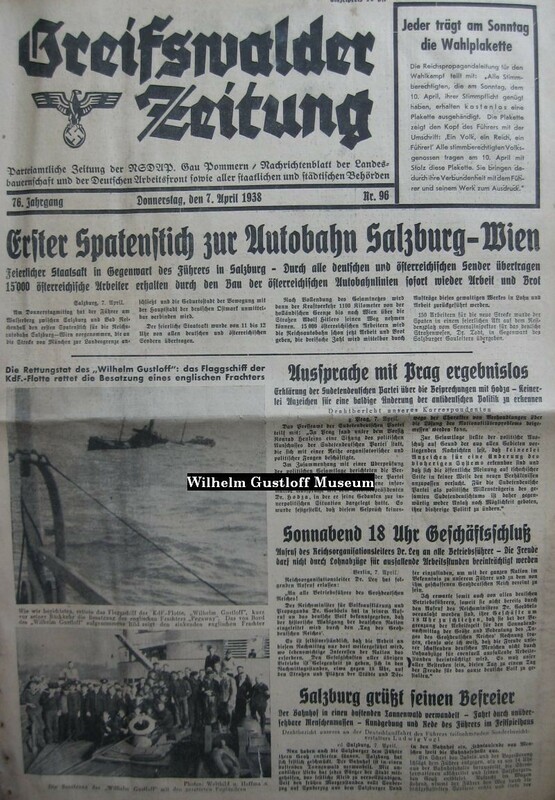 #10: Lifeboat against the Gustloff. #11:"The ones who were saved in boat 6, 1 April 1938 Wind force at night hurricane." #12: Passengers and crew on by the boat station. #13: Back of Card: Untranslated. #14: Storm waves from the rescue. #18: Passengers and crew on deck. #19: Passengers and crew on deck. #20: Survivors of the Pegaway being tended to by the crew of the Wilhelm Gustloff in her dining room. 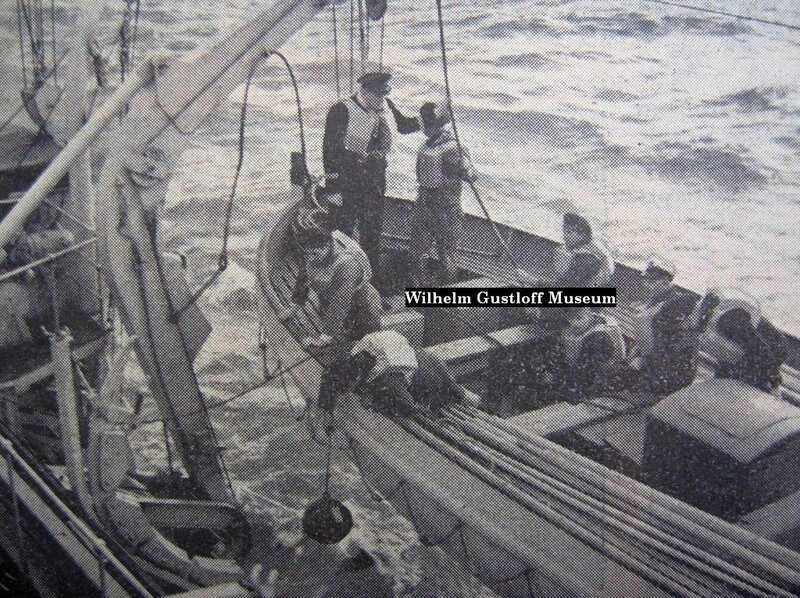 S/S Pegaway 2 Crew rescued by the Wilhelm Gustloff. 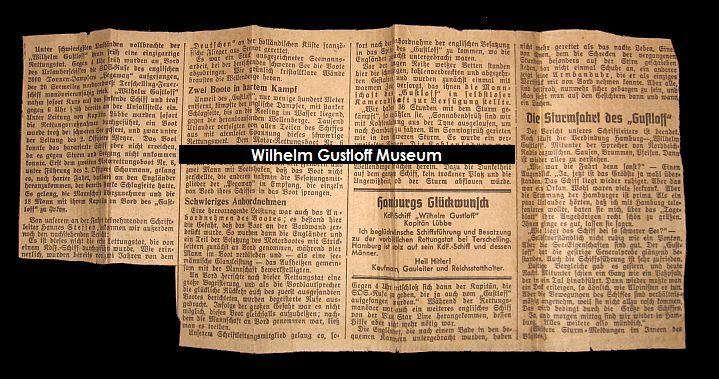 Original Newspaper Article on the Wilhelm Gustloff rescue of the Pegaway crew. This morning the “Wilhelm Gustloff” accomplished a unique rescue operation under most difficult conditions. About 4 a.m. the holiday cruise liner received SOS calls of the English 2,000 ton steamer “Pegaway”, drifting not under command approximately 20 nautical miles North-North-West of Terschelling light-ship. “Wilhelm Gustloff” immediately set course for the sinking ship and arrived on scene at 0600. Under supervision of Captain Lübbe, the rescue operation started immediately despite heavy seas. Lifeboat No. 1 under command of 2nd Officer Meyer was lowered into the water. However, due to the difficulties to run against the storm and high waves, it couldn’t reach the disabled ship. It was Lifeboat No. 6 under 2nd Officer Schürmann which made it, heavily battered by the sea, to approach the heavily listing English vessel from the port side. All crew of 18, together with their Captain were brought on board of “Gustloff”. ​ Following report was submitted by our editor who participated in the voyage: This is not the first rescue accomplished by a KdF-ship. We remember the French pilots which were rescued by “Der Deutsche” off the Dutch coast two years ago. To lower the boats under these conditions today was an outstanding accomplishment. Like greenish, crystal-clear walls the waves were closing in. Two boats fighting hard. The heavily listing English vessel, battling the seas and water up to the gunnels, was just a few hundred meters away from “Gustloff”. A thousand passengers were witnessing the breathtaking rescue. Rescue boat No. 6 managed after a hard fight against the waves to approach the steamer from the port side; two crewmembers with fenders, two others with boathooks avoiding the boat smashing into the ship’s side – the others were helping the “Pegaway” crew, which jumped one by one into the boat. Then a difficult return. A superb achievement was the safe return of the rescue boat, which was endangered by getting shattered on the ship’s side. First, all English and parts of the rescue boat crew came up on pilot ladders, while four remained in the rescue boat and lifted it under the assistance of the ship's crew back on deck. There was a great atmosphere onboard and when the deck speakers announced the successful return of the first rescue boat, a cheering crowd could be heard. As the risk was just too big, it was impossible to bring the other rescue boat back on board; after its crew was back onboard, the boat was let adrift. Our reporting editor was able to get access to the ship’s hospital where the rescued men were accommodated for a while. There were these dirty, coal stained and skinny bodies, outfitted with warm clothing which was handed over in unselfish comradeship by “Gustloff's" crew, standing in front of the long row of white beds. “We were fighting the storm for 36 hours”, they report. “On Saturday morning we departed from the Tyne with coal, destination Hamburg. The storm hit us on Sunday morning. It was a desperate fight. We lost cargo into the sea. She was in disabled in her manoeuvrability, wave after wave buried us. Then the darkness all over the ship, no place left dry and the uncertainty when the storm will calm down. My congratulations to ship’s senior officers and all other staff to the exceptional rescue at Terschelling. ​The city of Hamburg is proud of its KdF ship and their men. About 4 a.m. the Captain made the decision to send distress calls, which were received by “Gustloff”. During the rescue another English vessel of the Blue Star Line arrived on scene. Her help was not necessary anymore. The rescued Englishmen, not much more left as just the bare life, took a bath and were the brought to comfortable cabins. One of them, the horror of the past hours still written in his face, didn't even have shoes on. Another one shows his watch – the only valuable item he could salvage. However, all of them happy to be safe and sometimes you can even see a smile here or there. “Gustloff's" voyage through the storm. The report of our editor ends here. 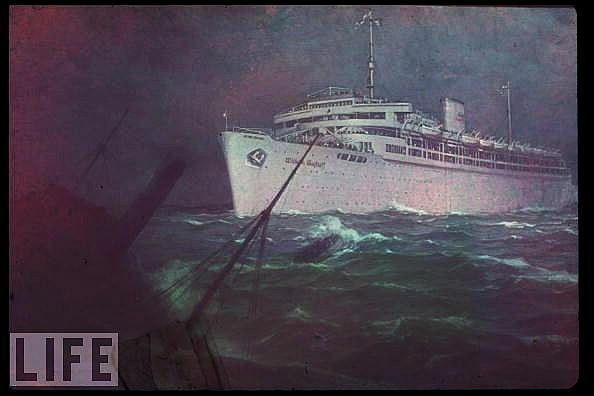 But the radio transmission Hamburg – “Wilhelm Gustloff” is still ongoing. Sometimes the operator of radio station “Norddeich Radio” is heard in between. Hauling, whistling, background noise - one moment later everything crystal clear. “How was the voyage in general?” – silence. “Now we are through the worst. The ship’s motion eased off a bit. This was a storm! Many here on board were seasick. However, the atmosphere is good. When some people from Hamburg have heard that I will phone Hamburg they asked me to send their regards via the “Tageblatt” to their beloved ones. They are fine they want them to know.”. “How behaves the ship in such heavy weather?” – “Of course it is not as still as a pontoon. But she has a good sea-worthiness. “Gustloff" has certainly made her rehearsal yesterday. The ship's senior officers are fully satisfied with her performance as well. Schiffsfuehrung … here: the leaders of the vessel but translated with “ship’s senior officers” due to lack of a more sufficient word. 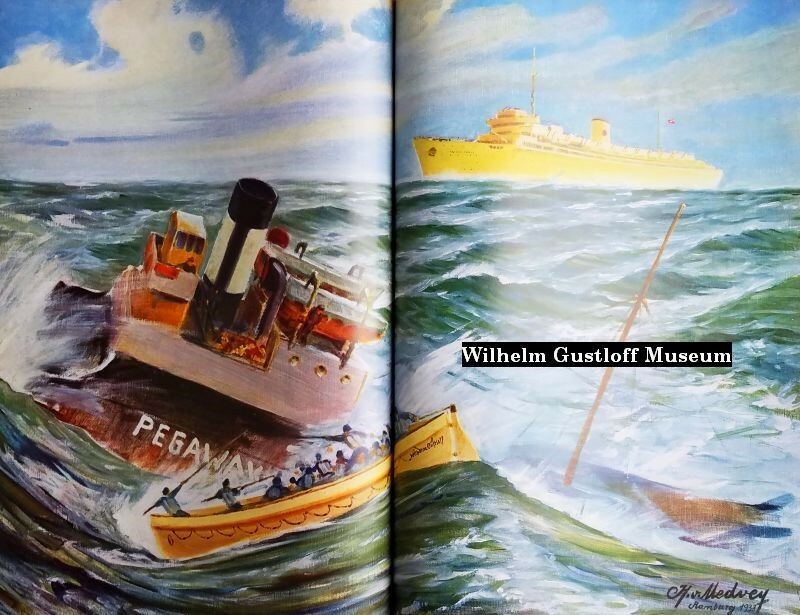 Painting: Wilhelm Gustloff Rescuing the SS Pegaway. 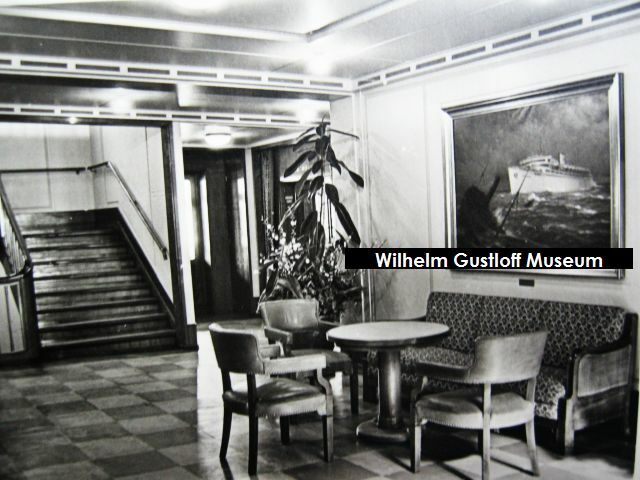 At right is a photograph of a painting of the Wilhelm Gustloff. A lesser known fact is that this commemoration painting depicts the Gustloff sailing through stormy seas to rescue the crew from the sinking Pegaway (foreground). If you look closely, you can see that lifeboats #2 (Should be boat #1) & #6 were launched and the ropes are hanging over the port side. Harder to see is the lifeboat in the middle full of Gustloff crew and Pegaway sailors rowing back to the ship. This painting originated from onboard the Robert Ley in a small lounge area off her front staircase. 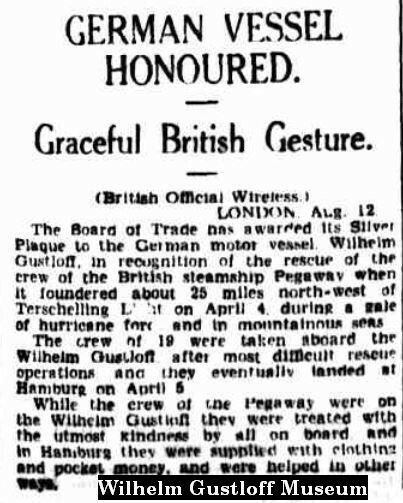 The Board of Trade has awarded its Silver Plaque to the German motor vessel Wilhelm Gustloff, in recognition of the rescue of the crew of the British steamship Pegaway when it foundered about 25 miles north-west of Terschelling Light on April 4th during a gale of hurricane force and in mountainous seas. 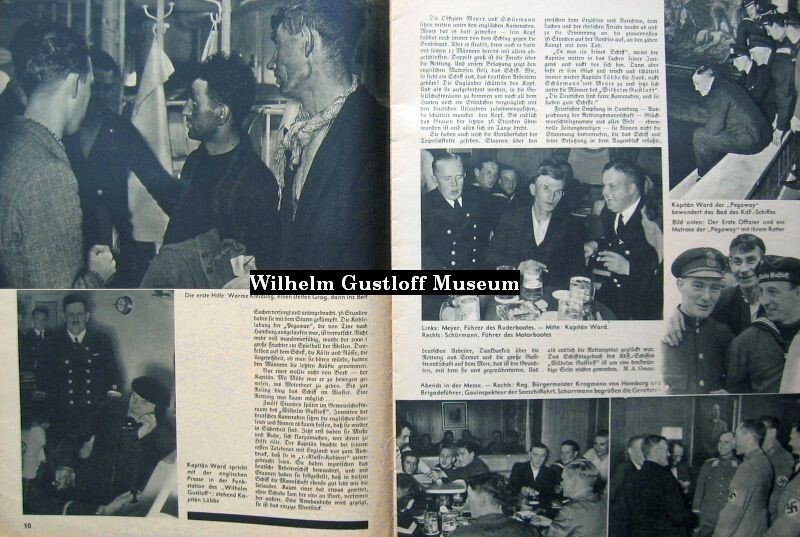 The crew of 19 were taken onboard the Wilhelm Gustloff after most diffucult rescue operations and they eventually landed at Hamburg on April 5th. 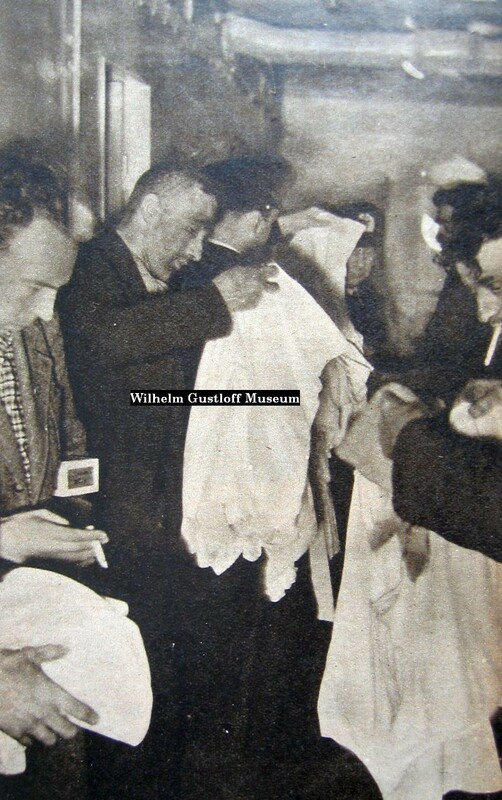 While the crew of the Pegaway were on the Wilhelm Gustloff they were treated with the utmost kindness by all onboard and while in Hamburg they were supplied with clothing and pocket money and were helped in other ways. Cover Caption: The flagship of the fleet KdF "Wilhelm Gustloff" met at sea by Italy, Africa, and Lisbon, returning KdF fleet. 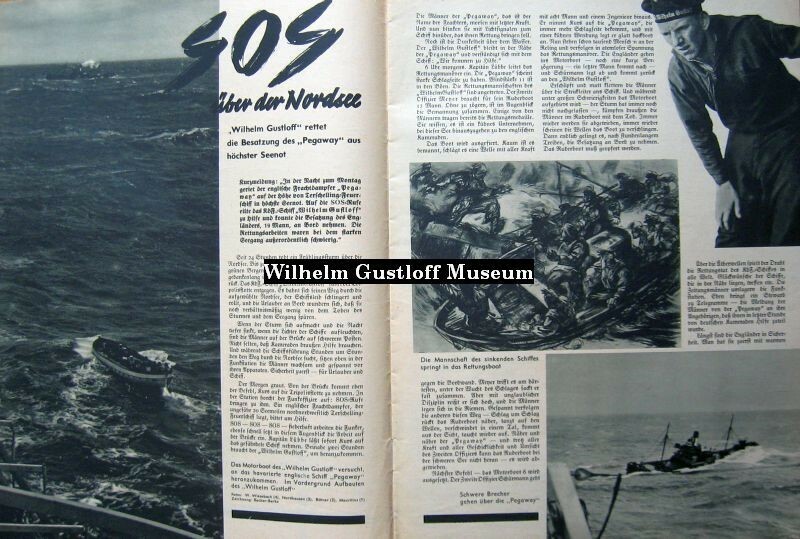 About the courageous deliverance of the "Wilhelm Gustloff" we reported in the interior of the booklet. 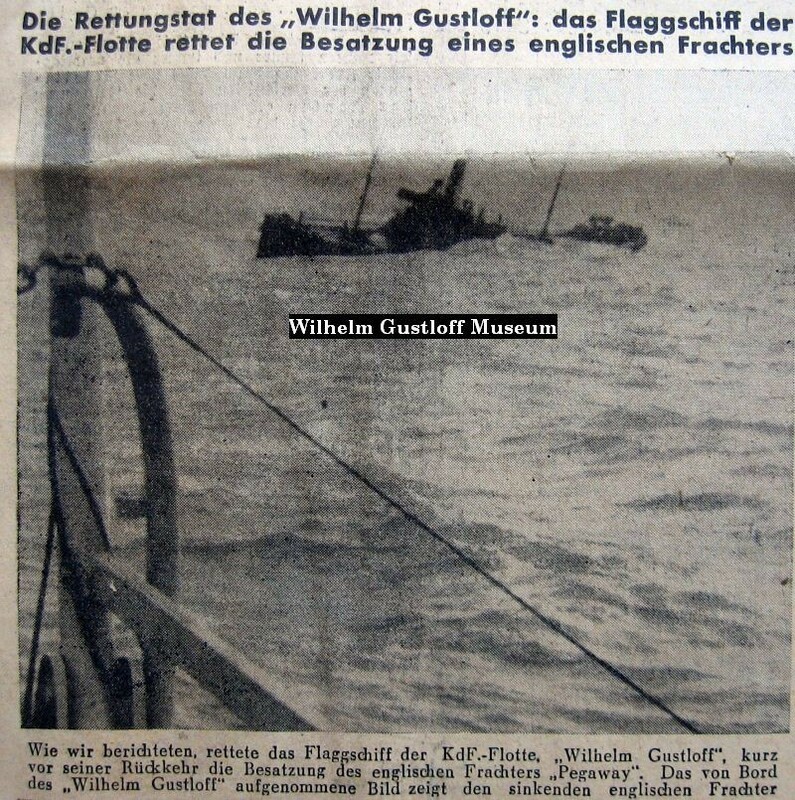 Das Flaggschiff der KdF Flotte "Wilhelm Gustloff" begegnet auf hoher See der von Italien, Afrika, und Lissabon zurückkehrenden KdF Flotte. Über die mutige Rettungstat des "Wilhelm Gustloff" berichen wir im Innern des Heftes. 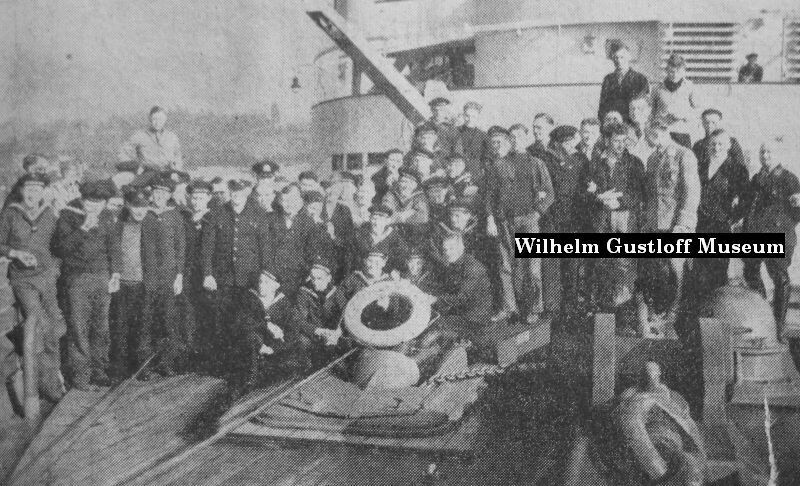 "Wilhelm Gustloff" rescues the crew of the "Pegaway" in dire distress. Short announcement: "On Monday night, the British freighter "Pegaway" sailing off Terschelling Lightship became entangled in the highest of distress and her S.O.S. cries hastened the KdF ship "Wilhelm Gustloff " to help. She was positioned to take 19 of the English seamen aboard. The rescue works were in heavy seas and were extremely difficult. For 24 hours, a spring storm rages across the North Sea. Up to 12 wind strengths are counted. Glass green mountains rise up like the waves that are tossed up in the air and thundered with a back lash. The KDF ship "Wilhelm Gustloff" runs to connect with the Tripoli fleet. As it winds its way through the stormy North Sea, the ship lurches and rolls body, and the tourists on board are amazed that they still feel relatively little of the fury of the storm and the waves. When the storm opens up and the night falls deeper, the lights illuminate the ships and the men on the bridge add heavy upholstery. Not infrequently that crew outside needed the help. And while the captain studied for hours to chart the course on the way through the North Sea, on top of ship, the radio station men are alert and stand tense in front of their cameras. Safety first - for tourists and boat. It's dawn. From the bridge are the orders to sail towards the Tripoli fleet. In the radio station an officer listens to: S.O.S. and cries reach him. An English freighter, about 20 nautical miles north-northwest of Terschelling Lightship is asking for help. S.O.S. - S.O.S. - S.O.S. - feverishly working with the radio operator, as fast can be the word is on the bridge. Captäin Lübbe can immediately set course for the endangered ship. Nearly two hours are required for the "Wilhelm Gustloff" to get there. 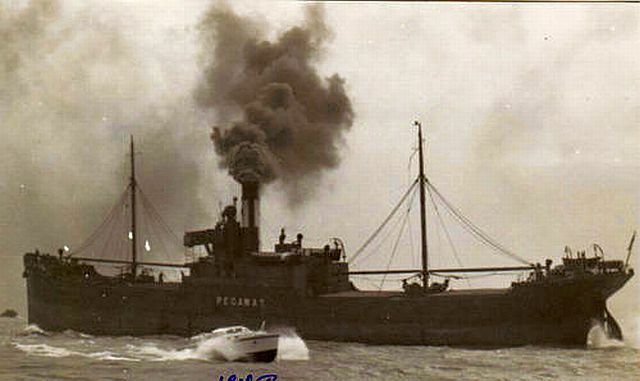 The men of the "Pegaway" which is the name of the freighter by Morse code, is listing with force. And now they are flashing light signals over to the ship which will bring them salvation. Still, the darkness is over the water. The "Wilhelm Gustloff" remains close to the "Pegaway" and agrees with the ship: "We come to the rescue." 6 o'clock in the morning. Captain Lübbe will initiate the rescue maneuvers. The "Pegaway" seems to have heavy list. Wind Force is 11 in the gusts. The rescue team of Officer Meyer needs 12 men for his rowing boat without hesitation, and this is the moment the crew stand together. Some of the men have been awarded the life-saving medal for this act. You know, it's a bold undertaking to go to this sea to the English comrades. The boat will go off. As soon as it is manned, it meets a wave of force against the hull. Meyer is hit hardest, and under the force of the blow he nearly collapses. But with incredible discipline he pulls himself up, and the men put themselves into rowing. Strained to follow the others this way - blow for blow the rowing boat moves closer, dancing on the waves, disappearing into a valley, from this point of view, then reappears. Closer and closer to the "Pegaway" - and the entourage with all the skill and care by virtue of the second officer, the rowing boat in heavy seas does not reach its target - it is driven off. Next command - the boat number 6 is launched. The second mate Schürmann will go with eight men and an engineer. He is heading for the "Pegaway" which gets more and more of a list on its side, and with a bold twist he puts smoothly to port. Now, a thousand people standing at the railing and watch in breathless suspense the rescue maneuvers. 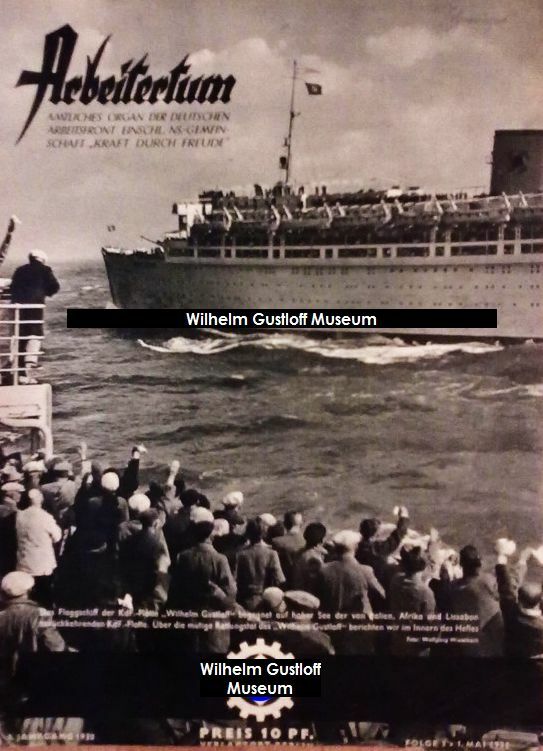 The British go into the boat - a short exchange - the last member comes - and Schürmann casts off and comes back to the "Wihelm Gustloff". Exhausted and weary, the men climb over the rope ladder to the ship. And while with great difficulty on the boat - the storm still has not subsided - the men in a rowing boat must fight off with death. Again and again they are driven off, the waves always seem to engulf the boat. Then, finally succeeded, after a long struggle those possessed in the boat are on board. The rowing boat must be sacrificed. On the airwaves, the deliverance of the KdF ship can rejoice in the world. Congratulations from the vessels that lie near arrive. The newspaper men crowded in around the radio station. Just a steward brings 19 telegrams reporting the men of the "Pegaway" to their relatives, that their last hour aid from German comrades was given. Now are the English in safety. They were first supplied with warm clothes and accommodation. 36 hours they fought with the storm. 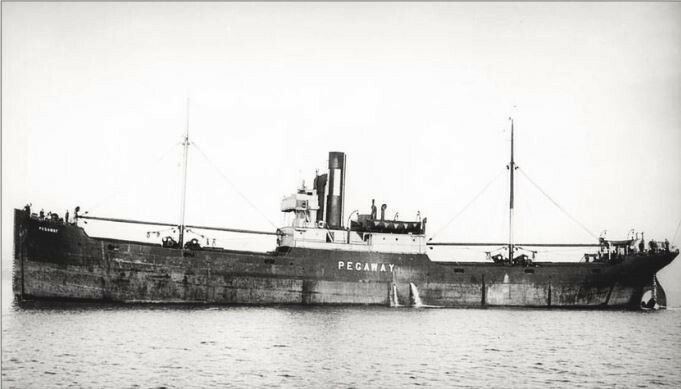 The coal cargo of the "Pegaway" which had sailed from Hamburg is slipping. No longer fully manoeuvrable, the 2,000 ton large freighter is at the mercy of the waves. It's dark on the ship, the cold and wet conditions, the uncertainty of whether they would hear they had taken the men's last forces. Only one did not want to leave the ship - the captain. With difficulty he was moving to go to the boat. Until the ship railing was hanging in the water. A rescue was nearly impossible ... Twelve hours later in the meeting room of the "Wilhelm Gustloff", the heart of the German comrades meets the British sailors and can hardly believe that they are safe again. Now before they have leisure and rest, they will make clear who rushed to help. The captain brought in his first phone call to England only to express the "1st class cabin" in that they are housed. You have now admired the German working ship, and we are amazed they have found that this ship. Now into leisure time the crew lives for a short while. ​Hardly anyone has saved much, one sailor was on board without shoes, the other is frozen. A watch is shown, it is the only valuable left. The officers accepted Schürmann and his comrades among the English. Meyer has struck hard - his head still roars from the blow against the hull. But he shines, as he had with his 12 men completed with everything. Twice great is the joy of salvation also. And we had the English sailors proudly displayed with the ship. How, does a ship, the German workers heard? The English shake your head. And when they are asked to come into the public spaces around enjoyable people after all that hard work for another hour with the German tourists, as many shakes his head. Until they finally overcame the horror of last 36 hours and everything turns to dance. You also have the seen the return trip of Tripoli fleet. Amazed by the German workers, gratitude for the rescue at sea and the great hospitality of the sea that is the root, with which they confront us. And between the stories and reports, the laughter and joy from the honest and appeared on the memory of the harrowing 36 hours to the North Sea, in the tough battle with death. "It was his ship," the captain said in the midst of the laughter of his obligations and nods to himself. But then he raises his glass and drinks and shakes again and again to Captain Lübbe the hand, nodding Schürmann and Meyer and crew among the men of the "Wilhelm Gustloff." "The Germans are fair comrades, and they have good ships." Formal reception in Hamburg - award of the rescue team - congratulations telegrams from all over the world - honorable newspaper notes - they can not fully convey the mood that had seized the ship and its the moment when at last the deliverance was successful. 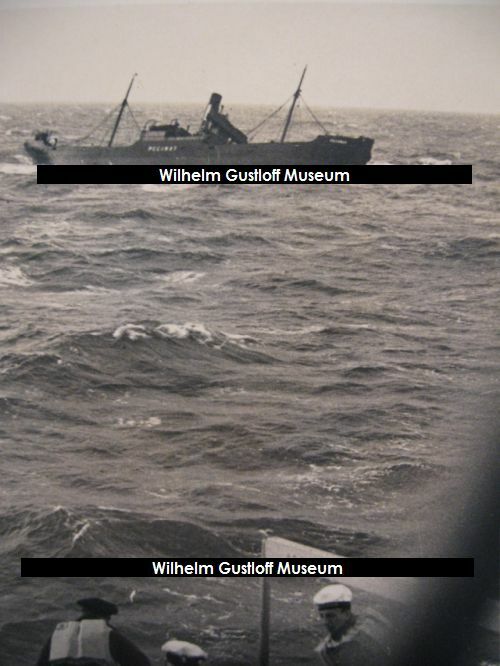 The logbook of the KdF ship "Wilhelm Gustloff" has gained a memorable page. #1: The boat of the "Wilhelm Gustloff" is trying to get hold of the wrecked English ship "Pegaway". The focus of the superstructure "Wilhelm Gustloff". #3: The crew of the sinking ship jumps into the lifeboat. #4: Heavy breakers go over the "Pegaway." #5: The first aid: Warm clothes, a stiff grog, then to bed. #6: Captain Ward talks to the English press in the radio station of the "Wilhelm Gustloff", standing Kaptain Lübbe. #7: Captain Ward of the "Pegaway" admired the swimming pool of the "Wilhelm Gustloff." #8: Left: Meyer, head of the rowing boat. - Middle: Captain Ward. Last: Schürmann, Head of the motor boat. #9: Bottom: The first officer and a sailor of the "Pegaway" with her ​​savior. #10 & 11: Evening in the show: last: Governing Mayor Krogmann of Hamburg and brigadier, Regional Inspector of Shipping, Schorrmann welcome the survivors. Die Woche or The Week - Heft 15, Jahrg. 40 - Berlin, 13. April 1938. The Rescue Operation of the Wilhelm Gustloff. 1 page article on the Pegaway Rescue. The Pegaway in happier times. "​Schiffs = und Reiseleitung wünschen allen kameraden frohe heimkehr und ein baldiges Wiederseh'n"
"Our ship and tour guide wishes all (ship)mates a happy homecoming and a speedy reunion." *In reference to the Pegaway crew on board. Wilhelm Gustloff Speisekarte, April 5th, 1938. 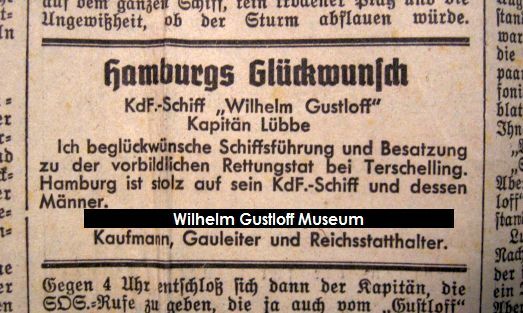 The rescue operation of the "Wilhelm Gustloff": The flagship of the KdF fleet rescues the crew of an English freighter. Above: A Pegaway life jacket. Thumbnail: Colorized version of lowering Lifeboat No. 1. 2017 was certainly a year for disappointment on my end regarding the Wilhelm Gustloff. Early on in the year, I was given the opportunity to purchase the entire Wilhelm Gustloff Archiv once belonging to Heinz Schön - a lifetime of work and information on the disaster. After a while, negotiations fell through and a fantastic historical archive of the ship still remains locked away in private hands. 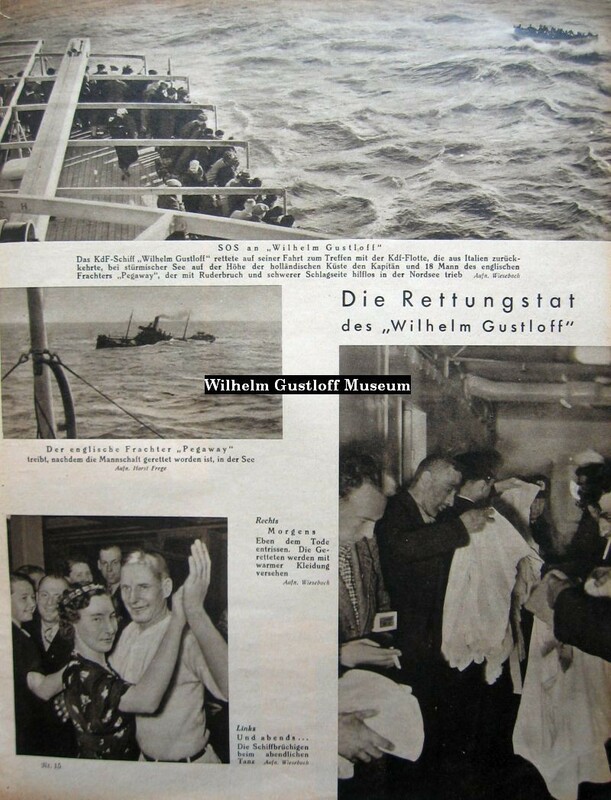 Then there is the story of the Wilhelm Gustloff life jacket. Back in October of 2015, ​I was contacted by a gentleman in England who had won this piece in a mixed lot auction. He had never heard of the Gustloff up to this point, and contacted me to learn more about it. 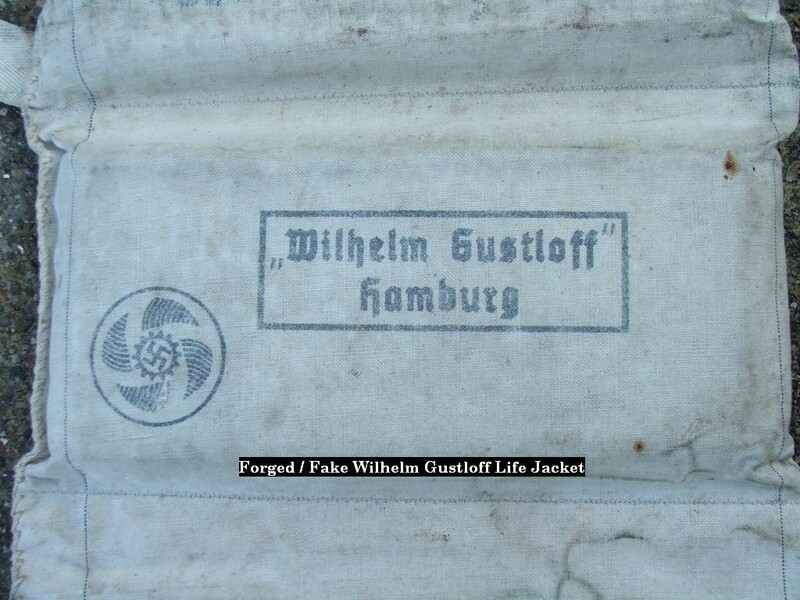 Of course, as soon as the images loaded, my jaw dropped and heart raced as I initially could not believe I was looking at an original Wilhelm Gustloff life jacket. Up until this point, I hadn't even heard of a life jacket or life ring surviving from the ship - but here one was! I replied with some information about the sinking and asked him that if he ever were to sell it, I would gladly place an offer on the piece. He considered my offer and we emailed back and forth sporadically over the next two years. Finally in early 2017, our correspondence focused more on my purchasing of the piece. A general price range was considered and we decided upon final price to add it to the museum collection. As I waited for his reply and our next steps, I decided to begin researching what I could about the Wilhelm Gustloff and her life jackets. Part of my research consisted of emailing a few colleagues of mine for anything they may know about it from their research on the ship. One of them, a noted author on the Wilhelm Gustloff, replied that something did not look authentic about the piece and questioned the markings. Until this point, I was in such awe of the piece, I took it as authentic - no questions asked. I started to wonder if I fell into the trap that so many people collecting from the Wilhelm Gustloff do - believing that anything marked with the name of the ship is original. In April 1938, the Wilhelm Gustloff rescued the crew of the sinking British freighter Pegaway in the North Sea. 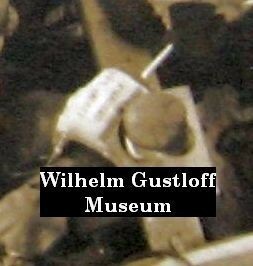 My first priority was to get these photos out because they are currently the only documentation of the Wilhelm Gustloff's life jackets being used during the rescue. After looking through the photographs and video from the time, every life jacket worn by her crew does not match this one. There is not much online about the time frame of life jacket styles and production, but it seems this style was used from the early 1900s up to the 1920s. By the time the Normandie set sail in 1935, this style looks to have evolved to having an additional top section as we see in the archival photos. The Gustloff crew are wearing over the head vests with 4 blocks on the front, 4 on the back - or possibly 2 on the front and back that bend in the center. You can also closely see that their shades in the black and white photographs are slightly darker than the white hats on some of the crew and the ship itself. This indicates her life jackets were orange as her life rings were known to be through color photos of the time. Finally, under closer inspection of the Pegaway photos, I was unable to find any marks on the life jackets in the photos. Why I found that interesting is because the crew of the Pegaway was in the same lifeboat as the Gustloff crew and you can see the markings on the Pegaway life jackets. I also looked at the markings Ob. Stm. which translate to Bootsobmann - the crew member responsible for the lifeboat, its course, and commands as well as Bootssteuermann - the crew member who translates the command into rowing instructions. Since those crew members were in the lifeboat at that time and if it was specifically made for them, I would have assumed that they should be visible in the photos. Rather, they each wore the same life jackets unlike this. I cannot imagine that a ship would have two completely different styles of life jacket made. Top Right: Two c1900-1920 life jackets. One could have easily been obtained and marked with stenciling. Over the past 10 years, I have discovered at least one forger in Europe that has taken items such as KdF flags to life rings and turned them into "original" pieces that can sometimes easily be proven fake. There is another person I also suspect of doing the same in another country. In my early days of collecting, I purchased several forged items I thought were originals and paid more than what it was worth because it carried the Gustloff name. With my years of research, I have dedicated a section on my website to educate those about these pieces and how commonplace they are becoming under the Souvenir page. Other times, the items are much harder to unearth as forgeries. Unfortunately, after my research and looking closer at this piece, my colleagues and I believe this life jacket is one of those forged items. Just as it fooled the seller and British auction house, I admit, it fooled me. I was surprised at how well it was done, a sign the forgers are getting much better at their craft. Unless a photograph emerges of this type being used on board, based on the evidence I suspect this piece was made as recently as a few years ago. I did inform the auction house of my findings and allowed them to use the information as they saw fit. ​As an original, it would have been worth in the $2,000 to $3,000 range. With white life jackets such as these available for manipulation, this forgery is only valued between $100 and $300. #22: The crew of both ships gather for a photo with a life ring on the Gustloff's bow. Left: 1938 painting by H. Medvey showing the crew of the Wilhelm Gustloff rescuing the crew of the sinking Pegaway. Featured in Freude und Arbeit Magazine, Issue 6, 1938. 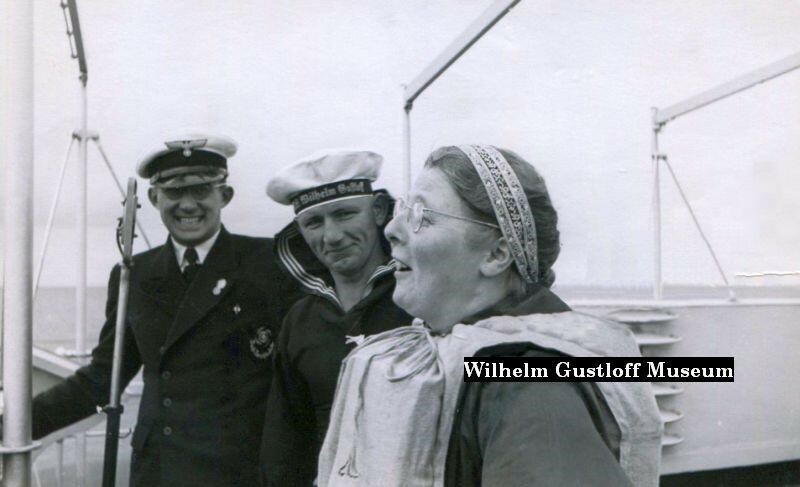 ​Right:​​​​ A passenger wearing a life jacket with crew from the Wilhelm Gustloff on a windy day. Possibly leading some sort of event aboard - perhaps a lifeboat drill?